Scientists believe that Fallout 3 might measure your personality as effectively as a long, boring quiz. Back in 2011, PhD student Giel van Lankveld noticed something interesting about Neverwinter Nights. If you compared the in-game experiences of characters with the personality test results of players, certain in-game actions lined up with prominent personality traits. These results were consistent among gamers and non-gamers alike, suggesting that video games could be just as effective at evaluating personality traits as any other formal quiz. Of course a single study couldn't actually prove anything, so van Lankveld set about confirming his findings with more science and a new videogame. Now van Lankveld's latest study is suggesting that the introduction to Fallout 3 could reveal a great deal about a player's personality. As with the Neverwinter Nights study, participants who had never before played Fallout 3 were given a period of time to complete the chosen scenario. After the time was up, players completed the NEO-FFI personality test, which ranks individuals in terms of Openness, Conscientiousness, Extraversion, Agreeableness, and Neuroticism. "From our results," the study reads, "we may conclude that personality effects on game behavior exist for all five traits of the Five Factor Model." While correlations between player personality and character behavior weren't as prominent as those in the Neverwinter Nights study, the authors still found the results to be statistically significant. For example, players with high openness rankings generally explored their environments at a fast rate while conscientious players avoided confrontational dialogue options. Players with high rankings in neuroticism, meanwhile, tended to avoid conversations altogether and usually took much longer to complete the scenario. 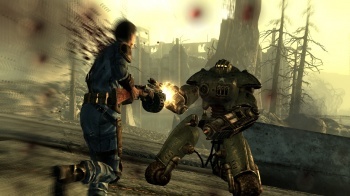 The study's authors acknowledge that some problems could skew the results, such as fewer measurable variables in Fallout 3's introduction compared to the previous experiment. Despite these limitations, the results still suggest that even in a digital fantasy your characters might have a lot to say about the kind of person you are. It's certainly enough to encourage van Lankveld to continue his research. His next study will be a large-scale experiment that observes the behaviors of players across several different games. Thanks to Michael Cook for the info.